Looking to head to Cape Cod this summer without the traffic? You may want to consider taking the Provincetown Fast Ferry which travels from Boston to Ptown in 90 minutes! 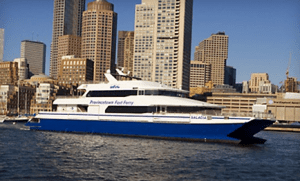 Goldstar Boston has discount tickets to the Provincetown Fast Ferry starting May 16, 2016 to October 10, 2016 for travel on Mondays, Tuesdays, and Wednesdays. Discount ferry tickets range from $45.50 to $61.60 + service fee and ticket quantities are limited. Keep in mind you do need to purchase tickets together if you would like to be seated together to take advantage of this deal. For more information about discount tickets on the Provincetown Fast Ferry via Goldstar Boston, please head here. Groupon also releases discount tickets every year, but they usually go fast– which happened last week as they were on sale for less than a day I believe. Hopefully they will release some more!